What horrible advice! Now, granted, your investment should become more conservative (less risky) as you get closer to whatever financial goal you are saving for whether it be retirement, college education for your children, a new car, etc. But, pulling out ALL of your money from stocks and bonds is a bad idea no matter how close you are to your big day. If you continue to invest in a diversified portfolio, you will have better chance of not outliving your money. So, why not cash everything out as you get really close to retirement? The stock market’s recent decline has everyone scared. That is for sure. And, no one is more affected by the decline than the retired, recently retired, and about to be retired investors. People who thought that they had a high appetite for risk have now realized that they actually cannot stomach all of that volatility after all. Withdraw Math. Many financial planners recommend withdrawing between 3-5% of your portfolio every year during retirement as a rule of thumb. If you retire at age sixty and live the current life expectancy for a male in the US (78), then you would have eighteen more years of life to draw upon your nest egg. At a withdraw rate of 5%, you would run out of money after twenty years assuming that you made no other additions to your nest egg portfolio and kept your money out of the market. But if you continue investing for retirement during retirement, you could be assured with relative certainty to have many more years’ worth of money to withdraw from during retirement. An Example By The Numbers. Based on a simple nest egg of $1,000,000, a sixty year-old retiree can withdraw 5% of the portfolio for twenty years before it runs dry. This is assuming that you never make another contribution to your portfolio and you do not earn any interest because you have yanked all of your money out of the stock and bond markets to preserve capital. 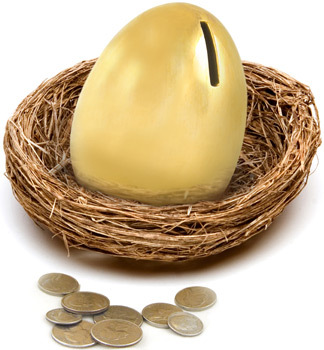 In the same example, if you continue making $12,000 Roth IRA investments for the next ten years during retirement from age sixty to sixty-nine years old, you could extend the life of your nest egg by three years before the money runs out. The $12,000 annual investment is derived from a couple who continues to make investments in a Roth IRA with catch up payments. Now, if you continue investing throughout retirement and earn a miniscule 2% average annual return on your well diversified investment portfolio, your nest egg could possibly last you until you were 88 years-old, a full eight years longer than if you pulled all of your money out of the stock market. Now, granted, I am not advocating having 100% of your nest egg invested in stocks on the day you retire. But, withdrawing every single dime from the stock market is foolish and is robbing yourself the continued chance to earn interest and more years of retirement. First I would like to agree w/ your comment about investing as one approaches retirement and after retirement. The problem now is that no one knows what the rules are. We have just witnessed several instances of changing the law. For instance, when one approaches retiremnet one normally increases investments in bonds (safer than stocks). However, our president has decided that bond holders (they actually own equity) in Chrysler will be paid after unions (that do not own equity). All of a sudden bonds are not safer than stock. Before PRESBO the bond holders owned things like inventory, buildings, machinery, and etc. How can one invest in the future when the rules change based on who the players are. Invest til the day you quit. However, modify your investments to be a bit safer as you get closer to retirement. Save, save, save. Then, move to Thailand.